Euroclad and Eurobond are Go! Euroclad and Eurobond were pleased to show support for charity Breast Cancer Care by placing a winning bid for their FAB1 Million Campaign at the Cardiff Fashion Show. 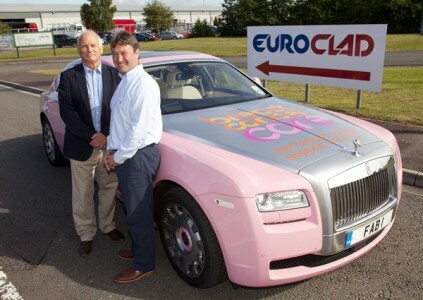 Respective Managing Directors Phil Cook and Simon Thomas were treated to a chauffeur-driven trip in the FAB1 Rolls-Royce Ghost (created especially for Breast Cancer Care) to the home of Rolls-Royce at Goodwood in Hampshire for a private factory tour. As well as the factory tour the prize, which was kindly donated by Chris Evans and Rolls-Royce, included VIP lunch with Rolls-Royce designers followed by a drive of the incredible new Rolls-Royce Wraith, before being chauffeured back to Cardiff in FAB1. 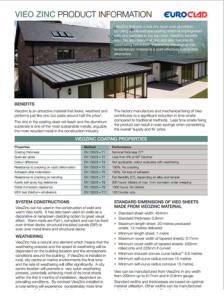 It is through associations with such high profile constructions and such prestigious brands that Euroclad has built and maintained its reputation at the forefront of the metal roof and wall cladding industry. Today we say goodbye to Rhian Edwards for the next eight months, with both sadness that she won’t be around but also with joy at the imminent birth of her second child. Rhian begins her maternity leave today and she will be sorely missed by us all at Euroclad and by all of her customers. The entire staff of Euroclad would like to wish Rhian all the very best for the coming months and we’re already looking forward to her return (although she may not be looking that far ahead!). We have recruited Ashleigh Bull to help fill the gap left by Rhian, working with Ian, Marc and Gethin to ensure there is minimal disruption. Ashleigh has already been with the company for 2 months, learning as much as she can from Rhian’s before her leave begins. Good luck Rhian with the final stages of your pregnancy and beyond; and good luck to Ashleigh in your new role.